Are you a fan of the Christmas horror movie franchise Silent Night Deadly Night? When the fifth installment of a movie franchise is finally made, it's best to keep your expectations low. One of the things I love about SNDN 5 is how it's an exception to that rule. This horror movie has come to have a very special place in my heart--and anytime someone mentions the title, my first reaction is to start laughing! With good reason, this campy fifth installment always makes me smile. I frequently have to watch the same Christmas movies over and over--to write about them, provide further commentary, and sometimes to answer a reader's questions. SNDN 5 is one of those movies I love watching again and again, seeing how the pieces of the puzzle all fit together once again in the end. How many times have you watched it? Innocent little Derek--who would want to harm this youngster and what would be his/her motivation? 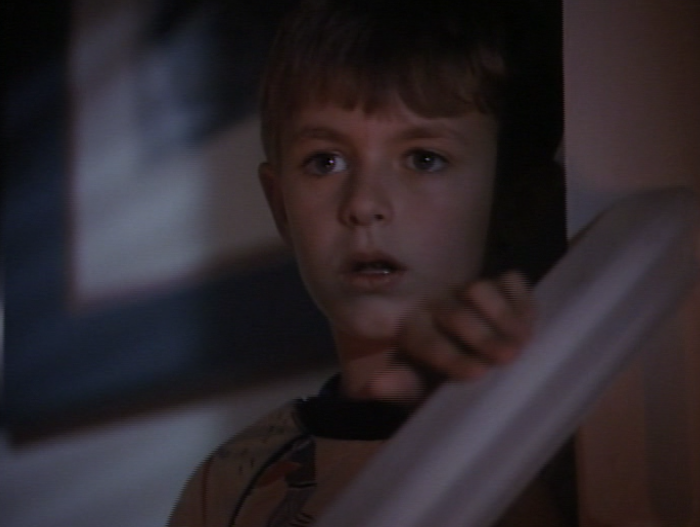 The movie begins with a small boy named Derek walking into his parents’ bedroom while they are making love. Next, Derek finds a Christmas present on the front porch addressed to him. His father Tom takes the gift away from him and sends the boy to bed. But moments later, the toy inside the package ends up attacking Tom--he defends himself and ends up falling upon a fireplace poker! Poor little Derek is so traumatized this Christmas, he loses his ability to speak. From this set up, we see this story is evoking the familiar scenario of a traumatized little boy at Christmas--just like the first, second, and third SNDN movies. This leaves us to wonder if this is just another crazed ax-wielding Santa Claus serial killer plot line. However, SNDN 5 continues into a much different movie. It's the TOYS that are deadly in this movie. 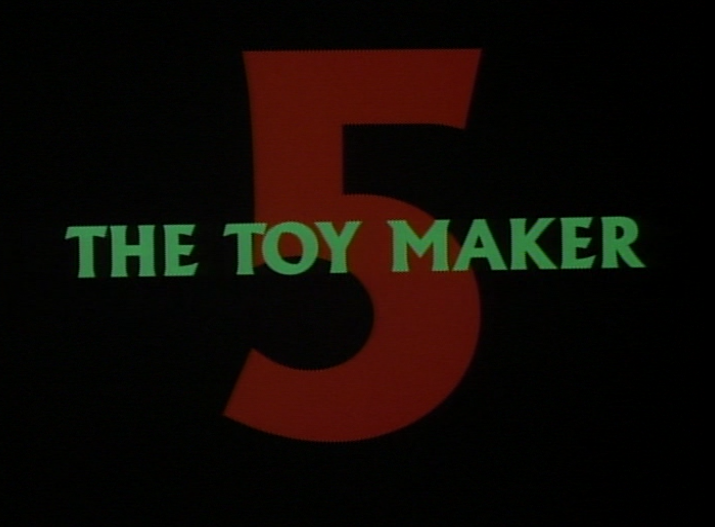 Not until the very end will you see what kind of Santa and his kooky workshop could make these life-threatening toys! It turns out that toys intended for Derek are attacking and harming people all over town. A creepy insect doll is offered to Derek, but ends up in the possession of an angry hotel manager. The deadly toy attacks him while he’s driving and he is killed. A pair of roller blades left on Derek’s doorstep end up on the feet of the bratty kid next door and he winds up rolling out of control and into oncoming traffic. Even a battalion of military toys are let loose in Derek’s home and they fire a deadly barrage upon his babysitter and her teenage paramour. Who is behind these deadly toys? Could it be Noah--Sarah's stalker? The mystery story provides viewers with several options for the person behind the deadly toy attacks. 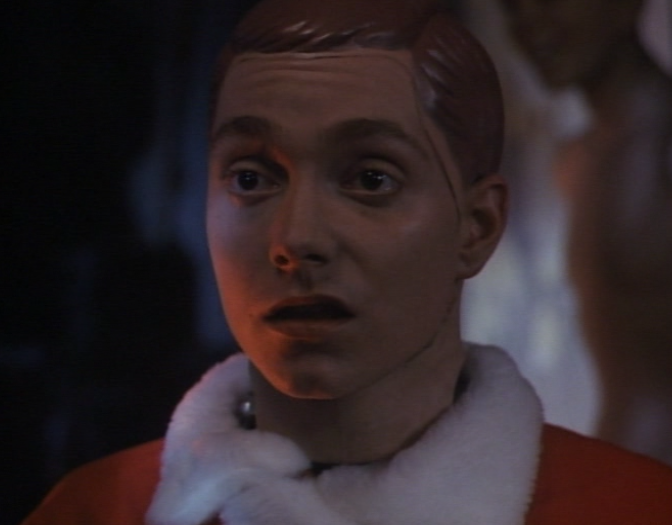 At first, we are suspicious of Noah, a man who works at a local shopping center as Santa Claus. His demeanor frightens young Derek when they boy sits on Santa's lap. Noah is also following--maybe even stalking--Derek and his mother Sarah. Later, we see him in a hotel room with several dozen toys taking them apart. There are many clues to Noah's potential involvement--but what would be his motivation to harm Derek? Joe and his son Pino--is one of them the violent one? Viewers also become suspicious of Joe Petto and his son Pino. Joe is the local toy store owner and toy maker while Pino is his prankster, teenaged son. 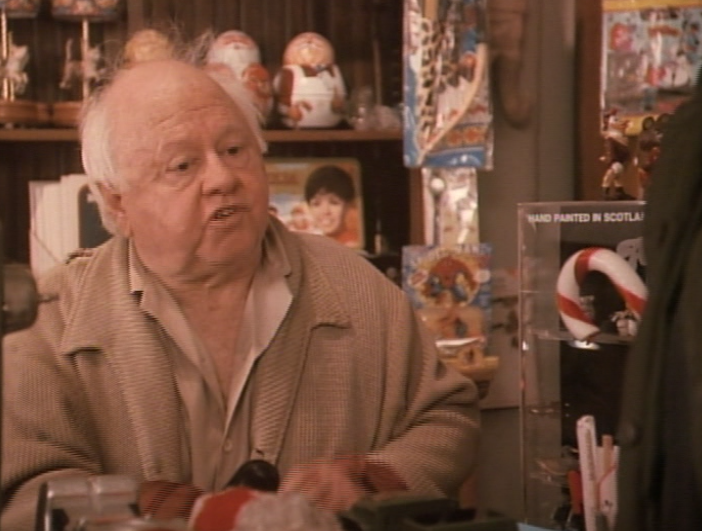 The elderly Joe owns an old-fashioned toy store that has seen better days. We also see that the friendly store owner has a very dark side--he's a drinker that can be very cruel and critical of his son. But Pino seems to be creepy too. The teen breaks into Sarah's home and goes through the rooms and her closets when no one is home. What's he looking for? There's also something not quite right about that boy. You know Joe's stock is out of date when you can spot a "Julia" lunchbox on the shelf behind the front counter! Joe Petto is my favorite character in this movie. Veteran actor Mickey Rooney plays against type as Petto, the drunken abusive father. You have to remember that Rooney made his name in Hollywood during the 1930s and '40s playing the character Andy Hardy in sixteen films--a happy-go-lucky, young man with a strong, solid family and a heart of gold. (Yes--there's a Christmas one, 1938's Love Finds Andy Hardy.) Rooney also starred in hope-filled inspiring movies such as Boys Town, National Velvet, and upbeat musicals such as Babes in Arms. You get the idea. (Rooney also proved himself in more serious roles in Requiem for a Heavyweight, his heavy role in "The Last Night of a Jockey" on The Twilight Zone, and elsewhere. But the highs of Rooney's career are dominated by his roles as the good guy. He even played Santa Claus for Rankin/Bass's animated TV specials three times!) So to see Mickey Rooney here at the other end of his career campily playing against his good guy image is awesome. It seems like he’s having as much fun with it as it is for us to watch him doing it. This isn't the first kidnapping Rooney commits during Christmas--remember THIS Full House Christmas episode? 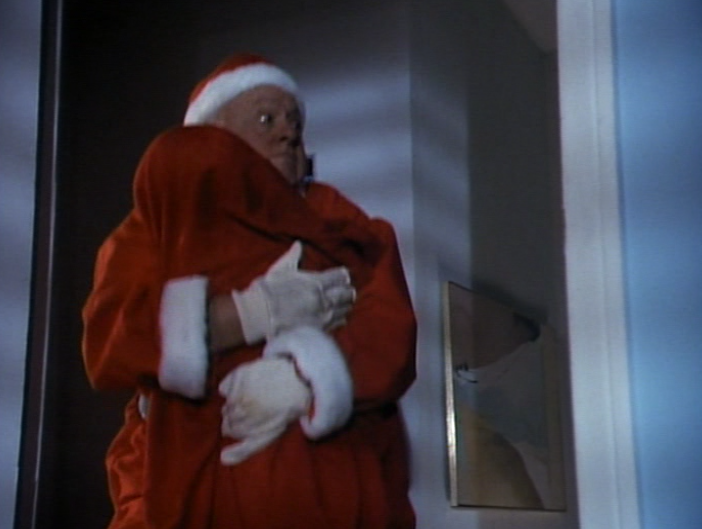 The movie even teases viewers with the possibility that Joe is a crazed, killer Santa--we see him kidnap poor Derek from his home in the middle of the night. But that's not the end of the movie. If you haven't seen this Christmas horror movie yet--I don't want to ruin the surprise ending. It is definitely worth discovering its reveal on your own. 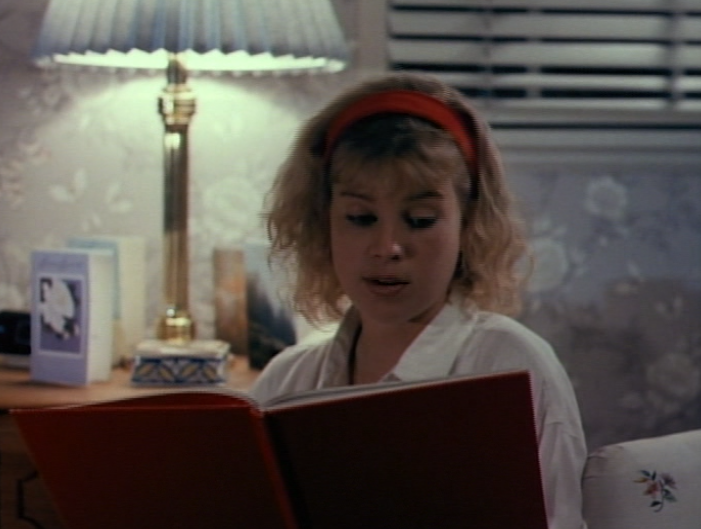 So STOP reading--and go find SNDN 5 on DVD NOW! If you've seen the movie before and you're still reading along, then you must love the ending as much as I do! I love re-watching this movie over and over, adding up all the easy-to-overlook clues. Remember the storybook the babysitter is reading to Derek? 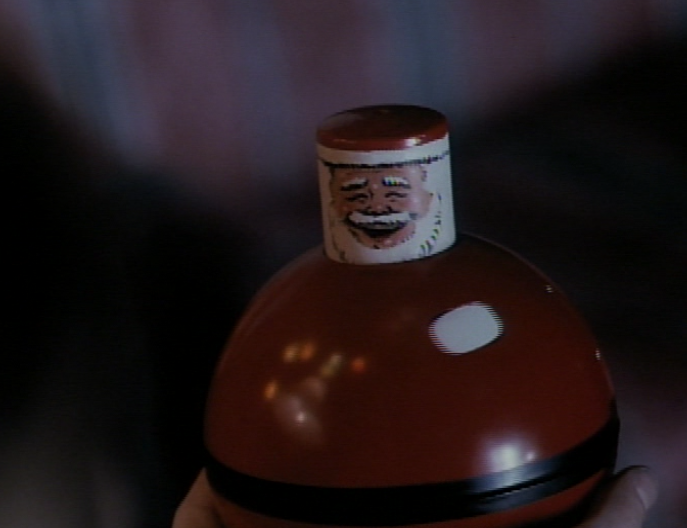 It turns out Petto isn’t the creator of the deadly toys after all. It’s his son Pino, the creepy, abused teenager in the background of the movie the whole time. We soon learn that Pino is a robot created by his father Joe after Joe’s pregnant wife died in an accident years ago. In the funnest movie twist I’ve seen in a while, it turns out Joe Petto (read Geppetto) has made a wooden boy come to robotic life--and now this PINOcchio son is jealous of the real boy, Derek. Pino wants to eliminate the youngster and has been making the deadly toys in his father's twisted workshop. Adding another creepy weird layer to it all, Pino has Oedipal feelings for Sarah, Derek’s mother, and wants to consummate his love for her! Of course, what every real boy needs is a strong father figure and Noah (Derek's biological father and Sarah's lover) arrives just in time to put a stop to all the trouble Pino has brought. That kidnapping Santa wasn't Joe after all--it was Pino donning another face! Pino--or Pinocchio--here looks like a manufactured cross between Davey from Davey & Goliath, and DEVO (when they wore plastic hair.) Very creepy! Remember in the original Pinocchio story, the wooden figure just wants to be a real boy! In SNDN 5, the same is very dark motivation for Pino. There are quite a few Christmas movies and specials that bring toys to life (many of them on the fringes of being very scary.) Many more weave familiar fairy tales into holiday adventures. SNDN 5 humorously places an original spin on these common story lines, making this mystery unfold within a campy horror film. Did you recognize what Derek is watching on TV in the beginning of the movie? 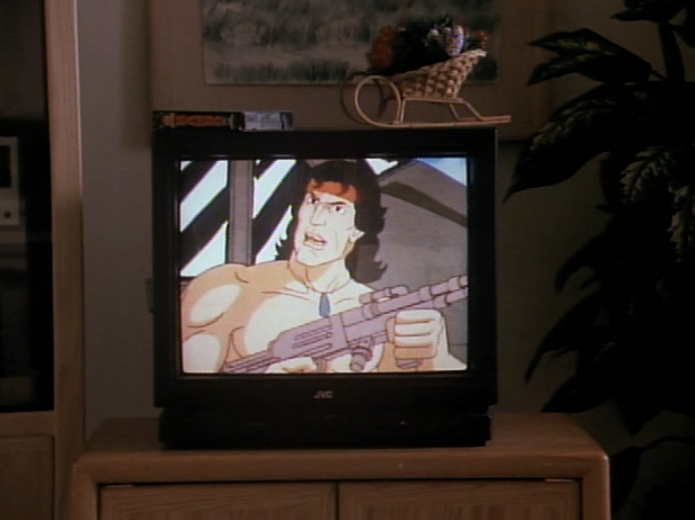 He’s watching the animated Saturday morning cartoon series Rambo:The Force of Freedom. Yes--the series has a Christmas episode! 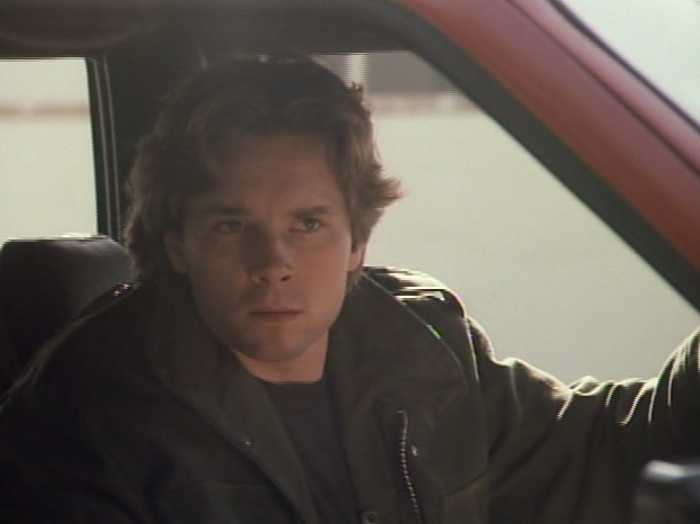 SNDN 5 has a few other fun pop culture references in it as well, including an all-too-brief part for cult film/TV actor Clint Howard. (Clint is also the real-life brother of director/actor Ron Howard.) 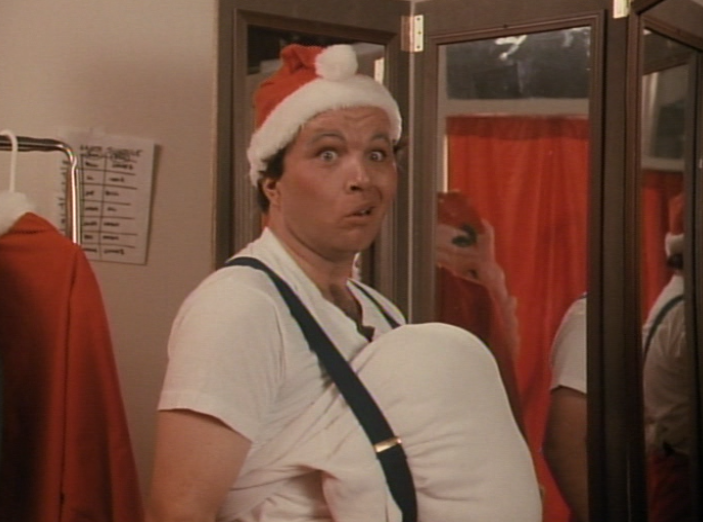 In SNDN 5, Howard plays a co-worker to Noah, another shopping center Santa Claus named Ricky. Fans of SNDN 4 might remember the characters of Ricky, Kim, and Lonnie who also make brief appearance here in SNDN 5. Let us not overlook one of the primary elements of the first, second, and third SNDN movies. (SNDN 5 teases our expectations with this same set up). These stories all begin with a young person who sees something so traumatizing, that they become madmen. I find this to be a brilliant premise for a horror movie--essentially daring viewers to watch a traumatizing story about an ax-wielding Santa Claus where viewers are shown the consequences: they too will be made madmen! (The Ring series of films and its imitators seemed to have taken a similar cause and effect to the next level, from metaphor to literal, but this concept is here in these earlier SNDN films too). What could be more traumatizing than seeing a crazed, deadly Santa Claus? I haven't seen this one yet. I had already dismissed it as a low-budget waste of time. But now I want to see it! Going to try and watch this coming holiday season. 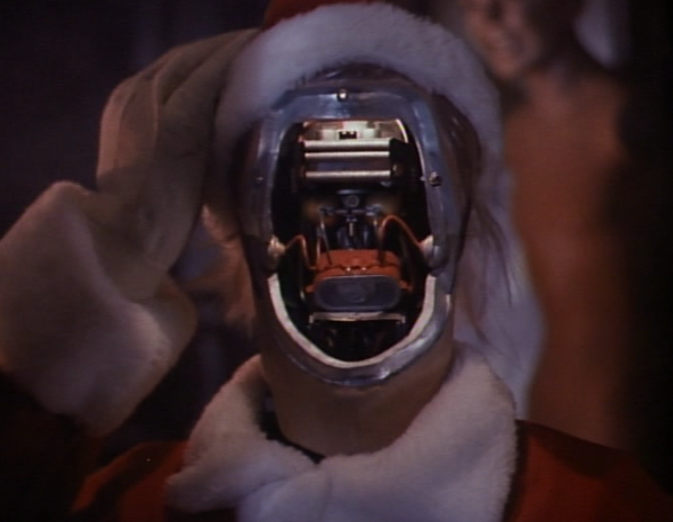 I am a huge fan of all different horror movie genres, and I love all types of Christmas viewing. I loved SNDN part 1 & even enjoyed part 2. After watching the 4th installment I thought I was done. But part 5 was better than I thought. 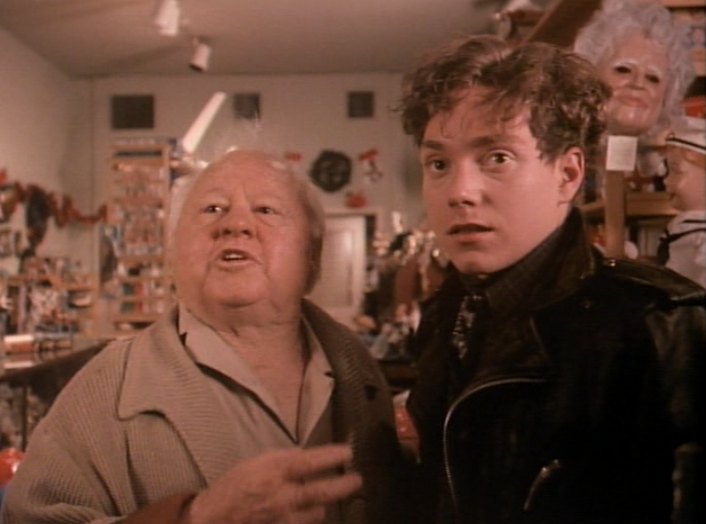 The mystery of who the killer was and seeing Mickey Rooney play such a different character was worth it. The Pinocchio twist was also interesting. I have not seen this but picked it up this summer and have added it to my list for this season. After your post I can't wait.